Study about the difference of chemical composition in tea brewed with different pots. Li X, Wei JP, Ahammed GJ, Zhang L, Li Y, Yan P, Zhang LP, Han WY. 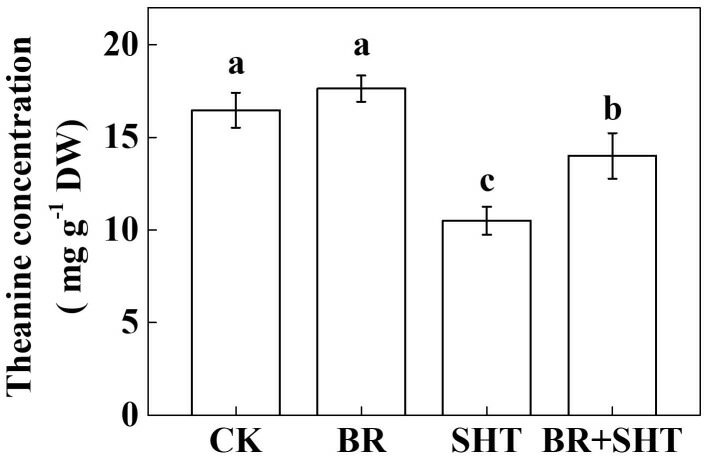 Brassinosteroids Attenuate Moderate High Temperature-Caused Decline in Tea Quality by Enhancing Theanine Biosynthesis in Camellia sinensis L.. Front Plant Sci. 2018 Jul 24;9:1016. doi: 10.3389/fpls.2018.01016. eCollection 2018. Study about L-theanine (umami flavor in green tea and bioactive compound of questionable clinical utility) declining in green tea leaves during hot temperatures. They actually set up this aspect of the paper quite nicely. Although it was been proven elsewhere, this paper puts previous findings to use in a very succinct way. This graph shows theanine concentration of leaves as a function of time during exposure to hot temperature (defined as >35C) in the leaves of a cultivar of long jing. The point of this paper is to find a compound that inhibits that temperature-related decline in theanine concentrations. They found a plant-steroid -- 24-epibrassinolide -- which acts as a stress-hormone for plants, and showed that pre-treatment with this steroid could mostly reverse the decline in theanine concentration. They tried to show that it was due to change in transcription of some of the upstream genes in the stress pathway that lead to theanine synthesis, but I don't put too much stock in these aspects of any study without a more robust mechanistic description. It's like painting flames on the side of your car and claiming that makes it faster -- adding these to the study does not make this a better study. Hongyacha (HYC) is a type of new wild tea plant discovered in Fujian Province, China. This tea is helpful to the healing or prevention of disease in its original growing area. However, research on this tea is limited. 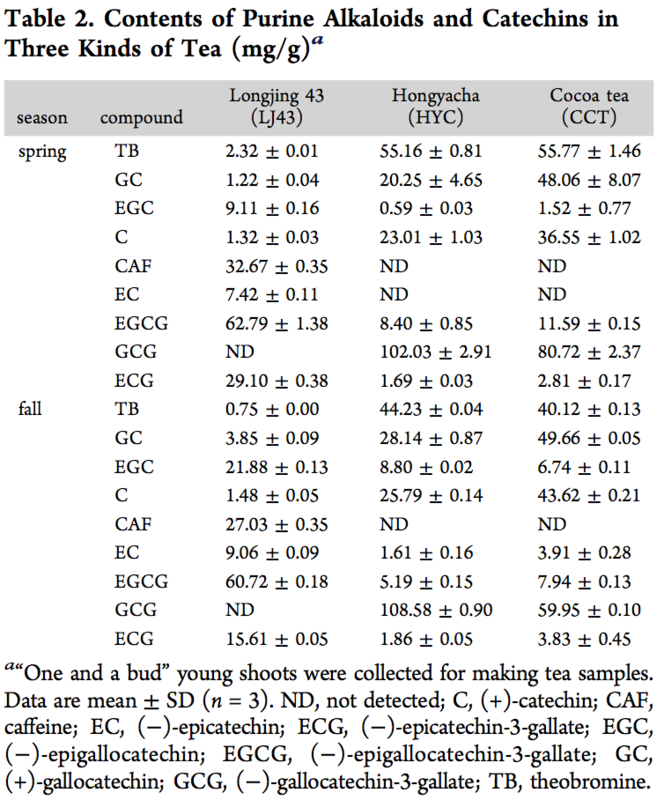 Our results showed that HYC displayed obvious differences in its morphological characteristics compared with Cocoa tea (Camellia ptilophylla Chang), a famous caffeine-free tea plant in China. Theobromine and trans-catechins, but not caffeine and cis-catechins, were the dominant purine alkaloids and catechins detected in HYC. HYC might contain abundant gallocatechin-(4 → 8)-gallocatechin gallate, 1,3,4,6-tetra-O-galloyl-β-d-glucopyranose, and (−)-gallocatechin-3,5-di-O-gallate, which were not detected in regular tea. We also found that the TCS1 of HYC was distinct, and the responding recombinant protein exhibited only theobromine synthase activity. The obtained results showed that HYC is a new kind of caffeine-free tea plant and may be used for scientific protection and efficient utilization in the future. i wonder how it tastes? would be great for evening drinking or tea lovers who have become sensitive to caffeine. 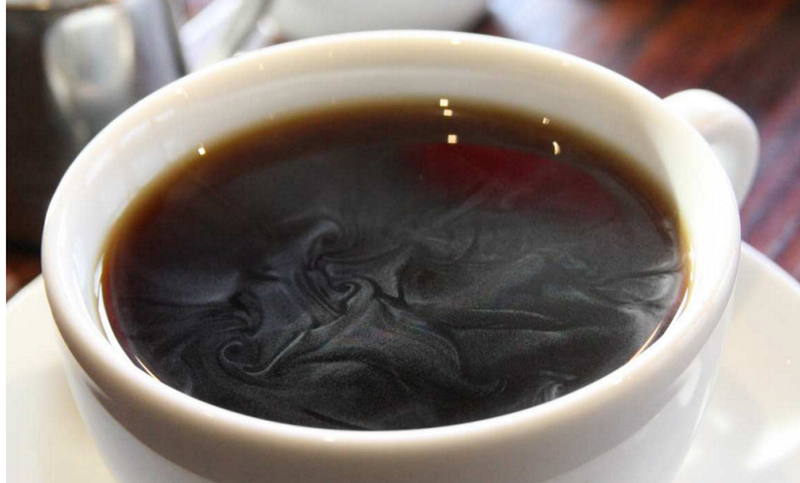 When drinking a cup of coffee under the morning sunshine, you may notice white membranes of steam floating on the surface of the hot water. They stay notably close to the surface and appear to almost stick to it. Although the membranes whiffle because of the air flow of rising steam, peculiarly fast splitting events occasionally occur. They resemble cracking to open slits approximately 1 mm wide in the membranes, and leave curious patterns. We studied this phenomenon using a microscope with a high-speed video camera and found intriguing details: i) the white membranes consist of fairly monodispersed small droplets of the order of 10 μm; ii) they levitate above the water surface by 10 ~ 100 μm; iii) the splitting events are a collective disappearance of the droplets, which propagates as a wave front of the surface wave with a speed of 1 ~ 2 m/s; and iv) these events are triggered by a surface disturbance, which results from the disappearance of a single droplet. worth a look for sure. nice pictures and interesting discussion. Inhibitory effects of tea extract on aflatoxin production by Aspergillus flavus. Mo HZ1, Zhang H, Wu QH, Hu LB. Lett Appl Microbiol. 2013 Jun;56(6):462-6. doi: 10.1111/lam.12073. Epub 2013 Apr 22. Aflatoxins, one of the most carcinogenic substances, have been implicated as a potential threat to the safety of tea beverages. 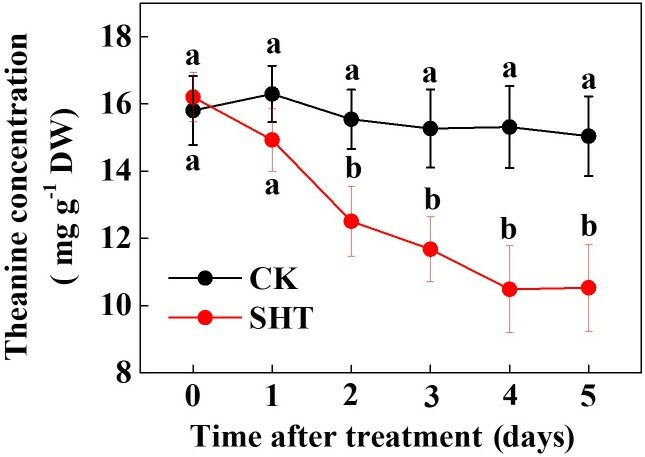 In this study, we studied the inhibitory effects of the aqueous extracts from several Chinese traditional teas, such as green tea, black tea, flower tea, raw Puer tea (naturally fermented Puer tea) and Puer tea (inoculated Puer tea), on the growth and aflatoxin production of Aspergillus flavus. All the tested extracts inhibited the production of aflatoxin B1, whereas they did not inhibit mycelial growth of A. flavus. Considering the highest inhibitory effect of Puer tea extract on aflatoxin production, a semi-quantitative RT-PCR was designed to detect its impacts on the expression of genes responsible for the regulation of aflatoxin synthesis. The results showed that the transcriptions of both aflS and aflR were down-regulated to undetectable levels by the addition of Puer tea extract. This study indicated that most tea contained molecules inhibitory to aflatoxin production, which were very important factors for the risk assessment of tea exposed to aflatoxin. Some tea extracts could be developed as antiaflatoxin agents in food preservation. Recently, safety concerns of the popular Puer tea have arisen because of aflatoxin contamination. In this study, we analysed the inhibitory effect of 30 tea aqueous extracts on the growth and aflatoxin production of Aspergillus flavus. Our results indicated that most tea inhibited aflatoxin production by down-regulating the transcription of aflR and aflS. The findings could contribute to the safety assessment of tea exposed to aflatoxin and provide some useful data concerning a new approach for controlling aflatoxin contamination. So.....does Aspergillus growing on Puerh then downregulate aflatoxins so less worrying than Aspergillus growing on peanuts? puerh is known to have alfatoxin contamination, and that article is about tea extract. i'm not sure what can be directly said about that alfatoxin production downregulation effect in actual puerhcha.